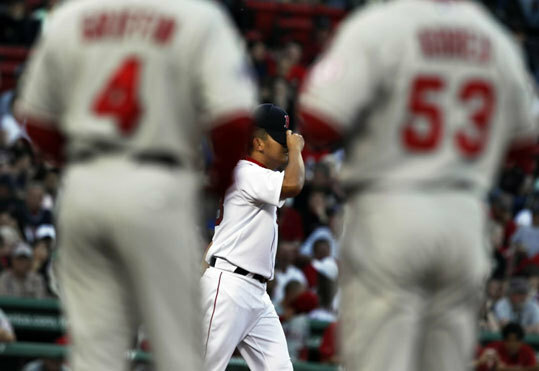 We’ve seen glimpses of Red Sox Nation, Wilderness Chapter time and time again. 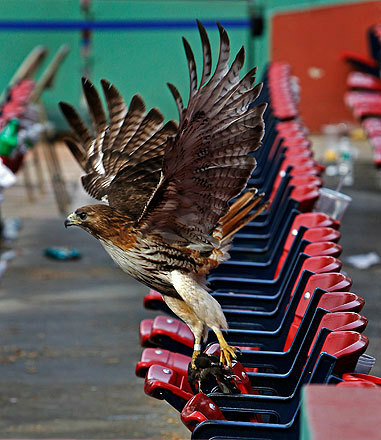 This hawk watched our rout of the Kansas City Royals on May 31, 2010 and stayed behind to revel in Boston’s glory. It’s a bird! It’s a plane! It’s…Kevin Youkilis? With the help of Adobe Photoshop, Youk does it all on the field as well as off the field. The imagination is a wonderful thing. This pretty much sums up everything you need to know about Big Papi’s personality. 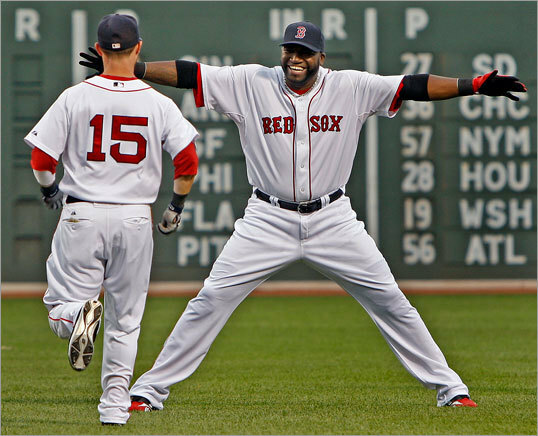 Here, he’s about to welcome back Dustin Pedroia from the disabled list with one of the world’s biggest hugs. This one just looks strange, but it wasn’t edited. Clay Buchholz looks like he’s getting ready to deliver and should be standing on the mound, but there’s an Angel running right next to him. He was actually standing at first after winning the sprint to the bag to get the out. You don’t have to be a celebrity to take sides in the biggest rivalry in sports; in fact, most of us aren’t. But hey, a fan is a fan, no matter how many TV appearances you’ve had. Here, John Krasinski defends his hometown favorites against Alec Baldwin’s verbal attack. 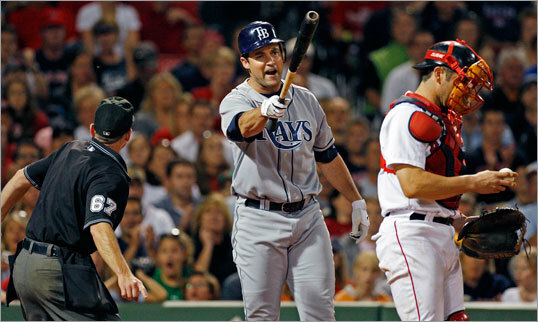 That is one angry Pat Burrell. On September 14, 2009, he went around on one of Jon Lester’s pitches and used some choice words to argue balls and strikes. He was very quickly ejected, and rightly so. He should know better than to argue balls and strikes when Jon Lester is on the mound. 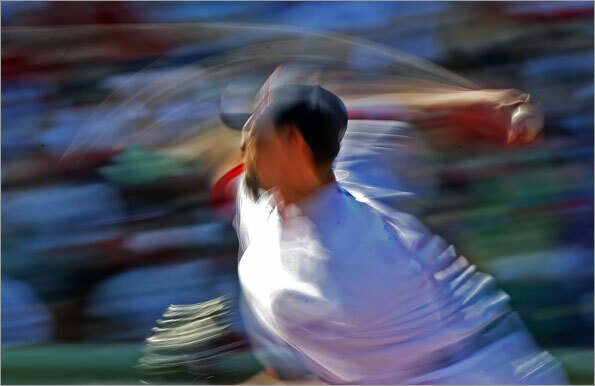 For all you sports photography fans, this is a great one. Dice-K returns to the mound after walking two to start our game against the Angels on May 6, 2010. Of course, unbeknownst to him at that moment, we’d eventually win it for the sweep. Did you know that the Yankees bought all of their no-hitters? It’s true. They have eleven regular season no-hitters and one World Series no-hitter, and all of them were thrown by free agents or products of trade. Not one of their original signings has ever thrown a no-hitter. Why am I not surprised. This has to be one of the coolest sports photographs I’ve ever seen. It’s Josh Beckett. Almost looks like a painting rather than a photo. Awesome. One of the things I like and respect about the Red Sox organization is that everyone does their part to help out. 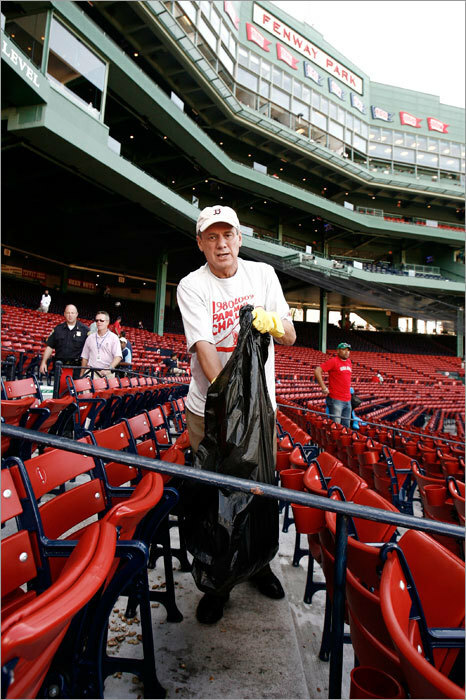 Here, Larry Lucchino is picking up trash to help clean Fenway between the games of our doubleheader with the Rays on September 14, 2009. Like Red Sox third baseman Mike Lowell, the 2009 Kia Optima is an out-of-the-spotlight player that’s fully capable of delivering the goods when need be. Rather than dazzle those in the stands with either a deep-center homer or a struck-out-swinging-for-the-fences at bat, Lowell is more apt to hit a single or double and get a few runners across the plate. And though the Optima isn’t capable of making a great catch and starting a double play like Mr. Lowell, it likewise boasts a subtle, well-rounded character that’s easy to like – for those willing to take notice. When Jacoby Ellsbury left the game on June 7, 2009 with a shoulder strain, Rocco Baldelli knew he was coming in. But would he play center and leave Mark Kotsay, who started, in right, or would Kotsay move to center and Baldelli take right? Rock, Paper, Scissors made that big decision, with a little help from Brad Mills. The Yankees have a bad attitude. That’s nothing new. But what happens when sports humor meets the Onion? A situation that’s so absurd it’s actually almost believable. We’re not the only ones who love baseball. Check out this squirrel watching the game from the best seat in the house: the outfield in Comerica Park in Detroit on June 2, 2009. Clearly a Red Sox fan, the squirrel wanted to conference with Jacoby Ellsbury and JD Drew and get an up-close look at what it’s like to win on the road. It’s no secret that the guys like to unwind and have fun in the clubhouse. Here, Sean Casey asks David Ortiz the tough questions. When Pedey came off, he looked like a drowned rat. Big Papi appears here for Comcast, doing all the things he does when he’s not busy hitting balls out of the park. The captain sharing his wisdom, as always. And he was absolutely right, too. Rookie of the Year, Most Valuable Player, Gold Glove, Silver Slugger. Dustin Pedroia does it all. Including providing Sony with a frontman for their video game, “MLB The Show.” Here’s a behind-the-scenes look at how Sony makes the game so realistic, with none other than the Destroyah as your host. The Kid, the Splendid Splinter, Teddy Ballgame; whatever you call him, when he had a bat in his hands he was more baseball god than man. Ted Williams was, without question, the greatest hitter who ever lived. No one has ever been able to even come close to his offensive ability. And in this video, it’s very easy to see why. I like this picture because it perfectly illustrates our captain’s importance to the team. He’s leader on and off the field, he’s a great team player, and he’s like a dad to the younger guys. Here he’s congratulating Jed Lowrie after his game-winning home run in extras against the Jays. This poem appeared in Boston.com’s Extra Bases. Mike Savio, a fellow Sox fan, wrote it after Manny was traded. It’s very clever, and it’s an accurate portrayal of the situation in which we find ourselves. The fans on their feet in a standing ovation. 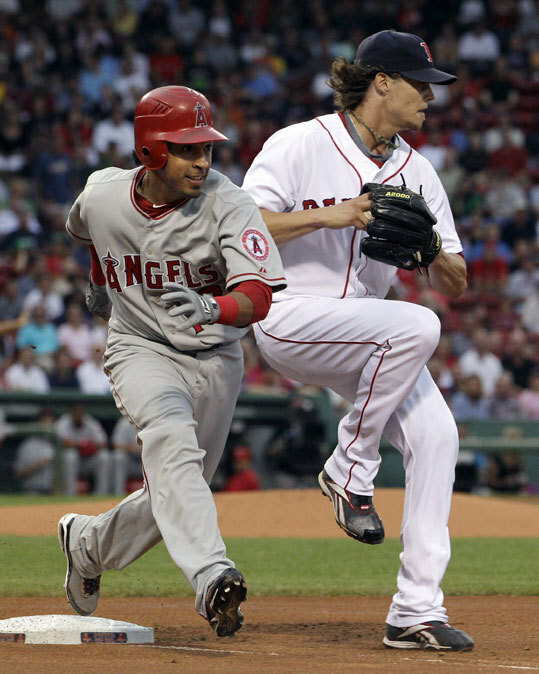 Ramirez – the baby – is off to L.A.
And produces the home runs; he has 22. And he’ll run out the grounders unlike you-know-who. Yes, Papi and Manny were like Gehrig-Ruth. So here’s some advice from a local Sox fan. By the way, Red Sox Nation, raise your glass in a toast. Pay homage to an old friend who’s on the West Coast. Thank you, thank you, oh thank you dear old friend Frank McCourt. So we hope for the best as the day turns to night. I’ll just finish my poem and turn out the light. I find I can’t sleep and I sit up in fright. I know Manny was wrong; God, I hope Theo’s right. Now playing with Nomar and Lowe in LA? I promise you this: there’s more to his story. The official drum corps of the Boston Red Sox bullpen: giving “Stomp” a run for its money. One of the reasons why we like NESN so much is because it’s so entertaining, and you have to love the visits to the booth by Lenny Clarke and Denis Leary. Here’s the text of what went down on that funny, funny day when Curt Schilling pitched and Kevin Youkilis hit and Lenny and Denis discussed Mel Gibson. 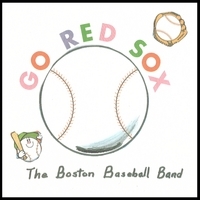 This is the kind of team that Red Sox Nation supports. Makes you proud. Remember the July 4th game with the Skankees in the Bronx? Remember Youk’s almost-home-run triple? Remember how Johnny Damon looked like a complete fool trying to get a handle on it and how he actually had to take directions from a fan? Well, just in case you don’t remember, here’s a picture. The official rain delay entertainment of the Boston Red Sox, courtesy of Jonathan Papelbon and Manny Delcarmen. Everyone who’s met him says that Manny Ramirez is the happiest guy in the world. Here’s proof. As a team and an organization, the Boston Red Sox do more for charity and the community than any other baseball team I’ve seen. Here, Jonathan Papelbon and his brothers help out as subjects of “Pitching with the Papelbons,” a children’s book by Jon and Lauren Goode with illustrations by Rachel Gregorio. Part of the proceeds from the sale of this book is donated to an organization that benefits children with and families affected by cystic fibrosis and cerebral palsy. I love this picture. You wanna talk about dirt dogs? 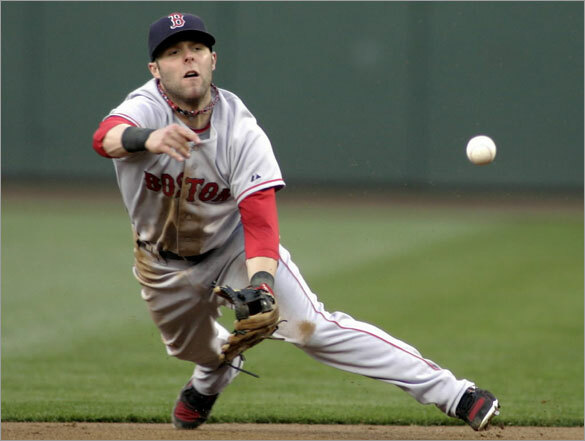 Here’s the quintessential dirt dog for you: Dustin Pedroia. He hits, fields, dives, slides, and hardly ever finishes a game without dirt on his letters. Way to play, Dusty. Yes, this is what you think it is. Johnny “The Devil” Damon poses here for a picture with his brand-new gold thong. You know, the undergarments designed for, but apparently not limited to, ladies? They were recommended by Jason Giambi, who wears them to get out of slumps. Derek Jeter has also worn them but claims they’re uncomfortable when running the bases. I’d make a quip here, but I think the whole situation speaks for itself. A great quote from a truly great player: David Ortiz. When life gives you lemons, smash ’em with a bat. Nike’s 2004 World Series commercial. Gets you right in the heart. Hey this post was quite informative for me. Looking forward to your next post. Thank you. on December 20, 2009 at 1:11 am | Reply N.H. Very interesting! Thanks for the read. Hello, first I want to say awesome blog. It’s always a great read. Keep up the nice work. Love reading your site, I usually learn new facts. on February 28, 2010 at 12:18 am | Reply O.B.P.